Clearwater, FL., November 12, 2016 – The Brandon Bombers are a youthful group that has been playing together for a short period of time, but is starting to figure out how winning feels at a young age on the adult amateur level. On Saturday afternoon at the Carpenter Complex near Brighthouse Field, the Bombers completed a goal they set out a year ago since losing to the Towson Titans in a semifinal contest: Win a national championship. That milestone mark was reached by Damian Fedele’s squad against a very talented Towson team from Maryland, as the Bombers put together a masterful 9-inning performance, scoring 11 runs and keeping the Titans’ bats at bay en route to a dominant 11-1 victory and the 25-and-over national championship now resides in the Tampa Bay area. The first few inning for Towson were especially tough, as the Titans were having problems getting out of the frames with no runs allowed. Issues started up in the first inning for the Titans, when the Bombers got three hits and two runs in the opening frame and the scoring barrage by Brandon would continue throughout the first half of the game. Two more runs would cross the plate in the second inning when Pat Tufrao hit a triple and cleared the bases to give the Bombers a commanding 4-0 lead. A dominating pitching performance from Tom Boleska would take center stage for the Bombers. Boleska pitched a masterful game in helping his club pickup its first championship, and the right-hander went the full nine innings and struck out eight batters, allowed six hits and only walked one hitter. Taking home the Most Valuable Player honors was Brandon Bombers’ third baseman Willie Martin, who went 2-for-3 with two singles and a run driven in. Martin has been a major piece to the Bombers’ success over the last two weeks and helping Brandon achieve its ultimate goal of winning a national crown. 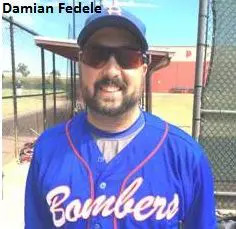 Martin said that the chemistry the team has built through playing in numerous leagues together before taking part in the MSBL tournament helped the club accomplish the goal at hand.